Coordination of Democratic Rights Organisation (CDRO) strongly condemns the arrest of the leader of the Bhangar anti-power grid peasantsʹ movement and spokesperson of the Bhangar Land, Livelihood, Environment and Ecology Protection Committee, Alik Chakraborty, from Bhubaneshwar on 31.05.2018 by a team of the West Bengal police. Alik has been suffering from life-theratening ailments for quite some time and had gone to Kalinga Hospital in Bhubaneshwar to receive treatment when he was arrested by West Bengal police. It is condemnable that the leader of a peoplesʹ movement was arrested in this heinous manner when he had gone to receive medical treatment. 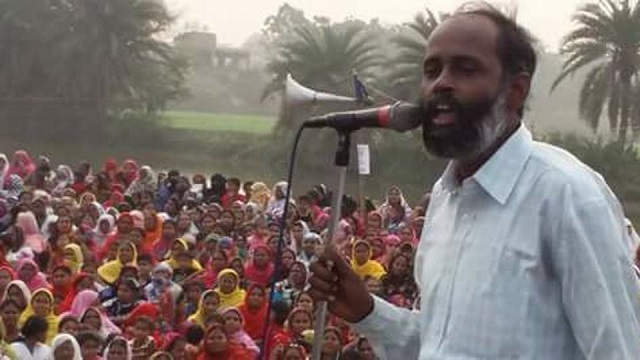 Recent events suggest that Chakrabortyʹs arrest is driven by the ruling partyʹs inability to accept the decision of the villagers of Bhangar in the panchayat elections as five independent candidates supported by the Bhangar Land, Livelihood, Environment and Ecology Protection Committee won the panchayat seats. This success has happened in spite of severe repression by the ruling party, including firing on rallies, forcible prevention of filing election nomination and kidnapping of family members of candidates. It appears that every democratic right of the people of Bhangar has been violated over the last one and half year by active machinations of the West Bengal government and ruling party of West Bengal.And when this has not been able to dampen or destroy the democratic movement of the people of Bhangar, the government has clamped down by arresting Alik Chakraborty, the spokesperson of the movement. The Bhangar peasantsʹ movement is continuing for the last one and half years demanding the stopping of the high-tension power grid which is being constructed in the area. More than thirty thousand peasants from 10-12 villages are involved in this movement against the construction of the powergrid which has been done in the most undemocratic and non-transparent manner. None of the provisions of the Right to Fair Compensation and Transparency in land Acquisition, Rehabilitation and Resettlement Act, 2013 has been followed in the land acquisition process for the power grid. Instead, land has been forcibly acquired at gun point by land mafia allied to the ruling party in West Bengal. When the villagers have protested against this they have faced severe state repression which has already taken three live, two of villagers who were killed in police firing in January 2017 and one who was recently killed by firing from goons of the ruling party in the run up to the West Bengal panchayat elections. Hundreds of cases have been lodged against villagers and activists including under Arms Act, Rioting Act and also Unlawful Activities Prevention Act (UAPA). When the validity of application of UAPA against activists of peoplesʹ movement was challenged in the Honʹble Calcutta High Court, the activists charged under UAPA were released on bail. The case is still pending in the High Court. Currently four activists of the Bhangar Movement Solidarity Committee are in jail under multiple false cases, three of whom got bail in all their cases just yesterday. It is reprehensible that instead of opening a dialogue with the people of Bhangor regarding their legitimate concerns, which has been their longstanding demand, the West Bengal government has chosen to adopt the path of repression to arrest and persecute the activists of a peoplesʹ movement. Alik Chakraborty be released immediately and all care should be taken about his health condition while in custody. All other activists of the Bhangar Movement Solidarity Committee, including Amitava Bhattacharya, Sankar Das, Biswajit Hazra and Dr. Ratul Banerjee be released immediately. False cases against all villagers of Bhangar and activists connected with the Bhangar movement be withdrawn. The West Bengal government, instead of repressive measures, should initiate a dialogue with the Bhangar peasantsʹ committee to find a resolution to their legitimate concerns in a democratic manner. Constituent Organisations: Association for Democratic Rights (AFDR, Punjab), Association for Protection of Democratic Rights (APDR, West Bengal); Asansol Civil Rights Association, West Bengal; Bandi Mukti Committee (West Bengal); Civil Liberties Committee (CLC, Andhra Pradesh); Civil Liberties Committee (CLC, Telangana); Committee for Protection of Democratic Rights (CPDR, Maharashtra); Committee for Protection of Democratic Rights (CPDR,Tamil Nadu); Coordination for Human Rights (COHR, Manipur); Manab Adhikar Sangram Samiti (MASS, Assam); Naga Peoples Movement for Human Rights (NPMHR); Peoplesʹ Committee for Human Rights (PCHR, Jammu and Kashmir); Peoples Democratic Forum (PDF, Karnataka); Jharkhand Council for Democratic Rights (JCDR, Jharkhand); Peoples Union For Democratic Rights (PUDR, Delhi); Peoples Union for Civil Rights (PUCR, Haryana), Campaign for Peace & Democracy in Manipur (CPDM), Delhi; Janhastakshep(Delhi). బీజేపీకి ఓటు వేయకండంటూ లేఖ రాసి ఆత్మహత్య చేసుకున్న‌ రైతు ! ఓట్లడిగే నైతిక హక్కు.. ఈ పార్టీలకు లేదు...!! లేబర్ ఆఫ్ లవ్... ఇది మన కథే..! బీమా కోరేగావ్ కేసులో మరో మంగళవారం.. పూణే కోర్టులో ఆ రోజు ఏం జరిగింది..?